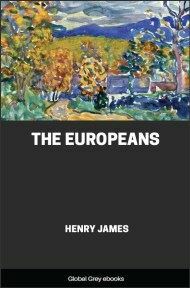 The Europeans is a novel by Henry James, published in 1878. It is essentially a comedy contrasting the behaviour and attitudes of two visitors from Europe with those of their relatives living in the 'new' world of New England. The tale opens in Boston and New England in the middle of the 19th century, and describes the experiences of two European siblings shifting from the old to the new world. A narrow grave-yard in the heart of a bustling, indifferent city, seen from the windows of a gloomy-looking inn, is at no time an object of enlivening suggestion; and the spectacle is not at its best when the mouldy tombstones and funereal umbrage have received the ineffectual refreshment of a dull, moist snow-fall. If, while the air is thickened by this frosty drizzle, the calendar should happen to indicate that the blessed vernal season is already six weeks old, it will be admitted that no depressing influence is absent from the scene. This fact was keenly felt on a certain 12th of May, upwards of thirty years since, by a lady who stood looking out of one of the windows of the best hotel in the ancient city of Boston. She had stood there for half an hour — stood there, that is, at intervals; for from time to time she turned back into the room and measured its length with a restless step. In the chimney-place was a red-hot fire which emitted a small blue flame; and in front of the fire, at a table, sat a young man who was busily plying a pencil. He had a number of sheets of paper cut into small equal squares, and he was apparently covering them with pictorial designs — strange-looking figures. He worked rapidly and attentively, sometimes threw back his head and held out his drawing at arm’s-length, and kept up a soft, gay-sounding humming and whistling. The lady brushed past him in her walk; her much-trimmed skirts were voluminous. 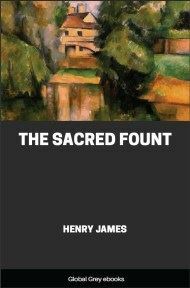 She never dropped her eyes upon his work; she only turned them, occasionally, as she passed, to a mirror suspended above the toilet-table on the other side of the room. Here she paused a moment, gave a pinch to her waist with her two hands, or raised these members — they were very plump and pretty — to the multifold braids of her hair, with a movement half caressing, half corrective. An attentive observer might have fancied that during these periods of desultory self-inspection her face forgot its melancholy; but as soon as she neared the window again it began to proclaim that she was a very ill-pleased woman. And indeed, in what met her eyes there was little to be pleased with. The window-panes were battered by the sleet; the head-stones in the grave-yard beneath seemed to be holding themselves askance to keep it out of their faces. A tall iron railing protected them from the street, and on the other side of the railing an assemblage of Bostonians were trampling about in the liquid snow. Many of them were looking up and down; they appeared to be waiting for something. From time to time a strange vehicle drew near to the place where they stood — such a vehicle as the lady at the window, in spite of a considerable acquaintance with human inventions, had never seen before: a huge, low omnibus, painted in brilliant colors, and decorated apparently with jangling bells, attached to a species of groove in the pavement, through which it was dragged, with a great deal of rumbling, bouncing and scratching, by a couple of remarkably small horses. When it reached a certain point the people in front of the grave-yard, of whom much the greater number were women, carrying satchels and parcels, projected themselves upon it in a compact body — a movement suggesting the scramble for places in a life-boat at sea — and were engulfed in its large interior. Then the life-boat — or the life-car, as the lady at the window of the hotel vaguely designated it — went bumping and jingling away upon its invisible wheels, with the helmsman (the man at the wheel) guiding its course incongruously from the prow. This phenomenon was repeated every three minutes, and the supply of eagerly-moving women in cloaks, bearing reticules and bundles, renewed itself in the most liberal manner. On the other side of the grave-yard was a row of small red brick houses, showing a series of homely, domestic-looking backs; at the end opposite the hotel a tall wooden church-spire, painted white, rose high into the vagueness of the snow-flakes. The lady at the window looked at it for some time; for reasons of her own she thought it the ugliest thing she had ever seen. 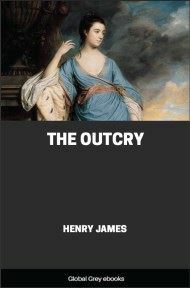 She hated it, she despised it; it threw her into a state of irritation that was quite out of proportion to any sensible motive. She had never known herself to care so much about church-spires. 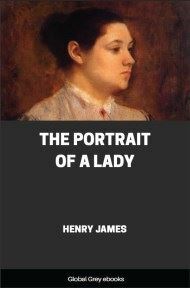 She was not pretty; but even when it expressed perplexed irritation her face was most interesting and agreeable. 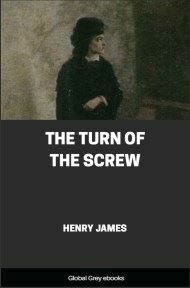 Neither was she in her first youth; yet, though slender, with a great deal of extremely well-fashioned roundness of contour — a suggestion both of maturity and flexibility — she carried her three and thirty years as a light-wristed Hebe might have carried a brimming wine-cup. Her complexion was fatigued, as the French say; her mouth was large, her lips too full, her teeth uneven, her chin rather commonly modeled; she had a thick nose, and when she smiled — she was constantly smiling — the lines beside it rose too high, toward her eyes. But these eyes were charming: gray in color, brilliant, quickly glancing, gently resting, full of intelligence. Her forehead was very low — it was her only handsome feature; and she had a great abundance of crisp dark hair, finely frizzled, which was always braided in a manner that suggested some Southern or Eastern, some remotely foreign, woman. She had a large collection of ear-rings, and wore them in alternation; and they seemed to give a point to her Oriental or exotic aspect. A compliment had once been paid her, which, being repeated to her, gave her greater pleasure than anything she had ever heard. “A pretty woman?” some one had said. “Why, her features are very bad.” “I don’t know about her features,” a very discerning observer had answered; “but she carries her head like a pretty woman.” You may imagine whether, after this, she carried her head less becomingly.